Healthy Mexican Food Recipes? Really! Is there such a thing as healthy Mexican food recipes? You betcha! My second favorite regional favorite would have to be Mexican. However, when you think of dining out at your favorite Mexican Cantina, you picture tortilla chips, fresh salsa with a yummy queso dip. Maybe you picture a chicken enchilada with Monterey Jack cheese topped with a tomatillo or queso sauce. Wow! The fat and calories really begin to add up. But again, with every regional food choice, there are better choices and then there are the best choices. In making the best choices in Mexican cooking, let’s first understand where the health benefits lie. One ingredient of healthy Mexican food recipes can begin with peppers such as the Chipotle pepper. This pepper is a red jalapeno that has been dried or smoked. This process helps to minimize the heat of pepper and gives it a milder, sweeter flavor. You can whip up some fabulous easy healthy Mexican food using this pepper alone. It is often found in an adobo chipotle sauce which means it is in a lightly spiced tomato sauce. Take one of these peppers out of the can, chop it up and throw it into you lean ground meat burger patty or put in low fat mayo to make a dipping sauce or spread. 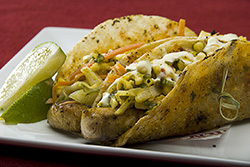 I have a recipe below for a favorite of mine, Chipotle Fest Shrimp Tacos. The thing about these poppin’ little peppers is that they are loaded with healthy benefits for our Healthy Mexican Food Recipes! This is where the pop in the pepper come from. 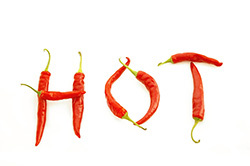 It is a chemical compound which delivers lots of heat to chili peppers. This heat causes your blood vessels to dilate which reduces your risk of heart disease and helps to improve circulation. Diabetics can benefit as well. Capsaicin is known to lower high cholesterol and blood glucose. There have also been studies showing that capsaicin aids in pain relief in patients who suffer with arthritis and fibromyalgia. Bring on the heat! The antioxidant benefits of this vitamin include prevention of cellular damage and tumor formation which is caused by free radicals. Vitamin A is also known to enhance immune functioning. There are 150 IU in each chipotle pepper. Among the many benefits of the chipotle pepper in creating healthy Mexican food recipes, the presence of Vitamin K is another. This vitamin is essential in platelet production which causes your blood to clot and stop bleeding when wounded. This Vitamin also aids in the absorption of calcium from food or supplements which could help in the prevention of osteoporosis. One chipotle pepper has about 3% of the RDA for adults. Add this one to your healthy Mexican food recipes collection! 1 whole jalapeno pepper with seeds removed. Place first 3 ingredients in food processor and chop. Next add tomatillos, avocado, and salt or salt substitute and pulse. This is a salsa verde which fits nicely into our Healthy Mexican food recipes. This salsa should be slightly chunky. Spoon into small bowl and stir in cilantro. Preheat grill. Combine first 3 ingredients in a bowl or zip lock bag and toss shrimp until coated. Grill shrimp about 2 minutes on each side over medium grill. You can use bamboo skewers for easier grilling but make sure to soak in water first or skewers will burn. Throw the whole wheat tortillas on the grill for about 15 – 20 seconds on each side. 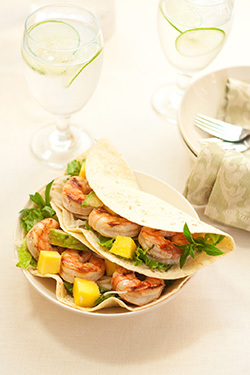 Prepare taco by putting a spoonful of sauce on tortilla followed by shrimp. Squeeze lime wedge on top, fold and enjoy this healthy Mexican food recipes meal! 4 servings (2 tacos each) Who said Healthy Mexican food recipes aren’t out there? Here is another one to try. 2 ½ teaspoons of chopped chipotle peppers in adobo sauce. Combine and mix well the above ingredients. Place in refrigerator to chill. View other Healthy Mexican Food Recipes!